February 2, 2014—In many people with autism and other neurodevelopmental disorders, different parts of the brain don't talk to each other very well. Scientists have now identified, for the first time, a way in which this decreased functional connectivity can come about. In a study published online today in Nature Neuroscience, scientists at the European Molecular Biology Laboratory (EMBL) in Monterotondo, Italy, and collaborators at the Istituto Italiano di Tecnologia (IIT), in Rovereto, and La Sapienza University in Rome, demonstrate that it can be caused by cells called microglia failing to trim connections between neurons. "We show that a deficit in microglia during development can have widespread and long-lasting effects on brain wiring and behaviour," says Cornelius Gross, who led the study. "It leads to weak brain connectivity, decreased social behaviour, and increased repetitive behaviour, all hallmarks of autism." The findings indicate that, by trimming surplus connections in the developing brain, microglia allow the remaining links to grow stronger, like high-speed fibre-optic cables carrying strong signals between brain regions. But if these cells fail to do their job at that crucial stage of development, those brain regions are left with a weaker communication network, which in turn has lifelong effects on behaviour. Yang Zhan, a postdoctoral fellow in Gross' lab at EMBL, analysed the strength of connections between different areas of brain in mice that were genetically engineered to have fewer microglia during development. 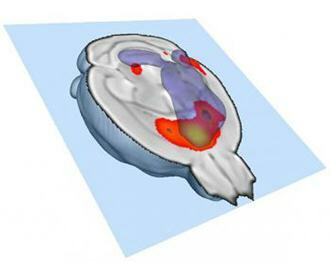 Working with Alessandro Gozzi's lab at IIT and Davide Ragozzino at La Sapienza University, the EMBL scientists combined this approach with high-resolution fMRI (functional Magnetic Resonance Imaging) scans of the mice's brains, taking full advantage of a novel technique developed at IIT, which enables scientists to obtain detailed, three-dimensional maps of the brain's functional connections. The team found that mice with fewer microglia had weaker connections between neurons, and less cross-talk between different brain regions. When Rosa Paolicelli, a PhD student in Gross' lab, studied the mice's behaviour, she discovered that mice with fewer microglia and decreased connectivity displayed behaviours commonly associated with autism spectrum disorders. These mice spent more time repeatedly grooming themselves, and avoided social interactions. "This is an exciting time to be studying microglia," Gross concludes: "they're turning out to be major players in how our brain gets wired up." Press materials provided by the European Molecular Biology Laboratory.